From school to pool - Los Angeles and Ventura County biodegradable balloon twisting and balloon sculpture art add a “pop” of color for more party fun! Feel good about your choice in entertainment and make this your eco-friendly holiday or birthday service choice! These fun and colorful environmentally friendly natural latex balloons that our balloon twisters use are 100% biodegradable, come from renewable, sustainably maintained forests, and decompose as fast as a leaf. They DO NOT contain plastic and will biodegrade when they are "played out" by your guests. If you are having a family reunion or a large gathering we highly recommend choosing a balloon artist to create 3D toys for your guests as our balloon twisters physically wear their supplies. This enables them to be able to walk around to clusters of people at a birthday party or roaming next to your buffet or play/event admission waiting lines. Per manufacturer’s recommendations, balloons should only be given to children ages 3 or above. Our basic party packages start at $250 and are based on location and time duration. Our expert level world-class award winning balloon master packages start at $375 and are based on location and time duration. EXCLUSIVE Deluxe UV Blacklight Balloon Twisting Package: Add on $150 to the base package price. Perfect for evening events, night clubs, trade show after parties, laser tag parties, and glow parties. Balloon twister design times vary based on complexity, e.g. a full intricate little mermaid doll can take up to 8 minutes per person while a simpler flower design only takes 2-3 minutes. On average a simple design takes 3 PER PERSON. If you are expecting a larger crowd please add on additional balloon twisters OR you can pre-pay us an additional amount to have pre-twisted balloons to hand out. Have a hands-on inflatable toy making experience for your guests where they learn how to twist and model balloon designs including a sword, dog, and great big giant hat! Each participant is supplied with all necessary materials to build each design and is guided through the balloon building process by one of our balloon workshop trainers. At the end of the day each participant gets to keep their designs to show off to their friends and family and take home. Best for ages 8-adult. Children under the age of 7 are not likely to be able to do this skill. Suitable for corporate team building events, after school care programs, Boy Scout and Girl Scout award dinners, summer camps, home school family events, and more! Each additional child is $7 in materials. Up to 150 people with additional staff and adult help. Suitable for INDOOR locations only such as meeting halls, cafeterias at schools, church reception areas, or summer camp mess halls. This workshop will NOT work in outdoor locations. Do These Work With a Pool Party? Yes! They float. Balloon twisting is a great pool party birthday party add-on service choice as kids can play with them both in and out of the water. Our professional balloon twisters arrive in our teal company shirt and tidy pants or skirt unless otherwise requested. Additional costume requirements incur additional charges. 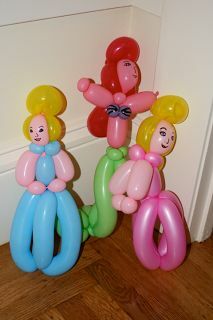 What Can Balloon Artists Make? Designs May Include: Swords, Flowers, Parrots, Cats, Dogs, Crocodiles, Bears, Candy Canes, Pumpkins, Princess Scepters, Tigers, Battle Axes, Butterflies, Guitars, Hearts, Giraffes, Horses, Palm Trees, Monkeys, and more!